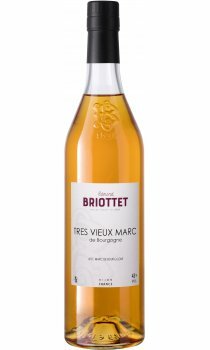 Vieux Marc de Bourgogne Briottet is produced from the distillation of marc from grapes growing in the Cote de Nuits and Cote de Beaune regions. To obtain an exceptional Marc de Bourgogne, they allow it to age in new oak barrels containing 228 litres. The result is an extreme roundness and the development of that incomparable 'taste from the soil'. It can be mixed with Creme de Cassis de Dijon (Burgundian recipe) or drunk straight after a meal.